As part of the Epson Projection Conference & Showcase 2017, Epson Singapore today presented Epson Town, a showcase of projection innovations that transform everyday life. 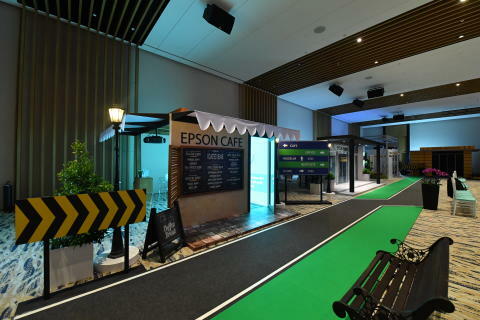 Held at the Singapore Chinese Cultural Centre, Epson showcased the concept of a small town, built around the use and application of Epson’s revolutionary 3LCD and laser projection technologies. With precision and performance at the centre of the showcase, guests experienced a live demonstration on the impact of holistic integrated solutions on areas such as education, corporate, home, retail, as well as public spaces for businesses and consumers. As the projection landscape continues to evolve, Epson believes that projection innovations are developing into important communication tools that engage audiences in new and exciting ways. In addition, the global technology giant believes that innovation works best when attention is paid to the details. Today’s rapidly changing educational landscape demands intelligent, easy-to-use technology that inspires new ways of thinking. Theclassroomtodayhasevolvedto encourage a learning dialogue between students and teachers with an interactive ultra-short throw display solution. Display size matters – although obvious, some do not realise that screen size is of paramount importance, especially in the common large classroom settings. A recent study in the US by Radius Global Market Research found that 58 per cent of students in an average classroom are unable to read content displayed on a 70-inch flat panel display. With large interactive screen size offered by interactive projectors, the projected images are not restricted to a specific size and can go up to 100-inches. In addition, interactive content can be delivered to every student in the classroom, and both students and teachers can interact with group projects using gestures or pens, make, share, and discuss notes without having to power up a PC. As interactive projectors become an increasingly popular teaching tool in classrooms, Epson’s projection technologies will continue to revolutionise teaching and learning by better engaging learners with attractive visuals and interactive features at an affordable cost. In today’s highly-pressured business world, Epson delivers technology and innovations that focus on high-performance, ease of use and reliability. These products help you work more efficiently and are capable of facilitating effective meetings and collaboration. Most importantly, with budget squeezes, value for money is paramount. Epson’s projection technology allows you to connect, collaborate and share information effortlessly on a truly multi-purpose projection system. It offers a smart collaboration platform for sharing and co-authoring, across long distances or with multiple PCs and mobile devices, to enhance your meetings and video conference with greater participant engagement. Epson understands the importance of delivering a high-quality cinematic experience in the comfort of your own home. Be it catching your favourite sports, watching a classic movie, streaming a movie box set, or playing the latest games, Epson’s range of home theatre projectors with high dynamic contrast ratio provides superior and bright Full HD image quality that brings the big screen to life, so you can indulge in the full immersive home cinema experience like never before. Retailers today are focused on improving the consumer shopping experience by connecting with customers in a unique and meaningful way. Epson enables the growth of new retail concepts and allows retailers to stay ahead of the competition by offering technologies that help businesses attract more customers and keep them coming back for more. As retail space shrinks, Epson’s ultra-short throw advantage enables retailers to project a large screen within the narrow space of retail windows. Epson’s projectors are extremely versatile, enabling retailers to project onto walls, ceilings and floors, bringing visual merchandising to life. Designed for installation in large venues such as at concerts and museums, Epson’s high brightness projectors facilitate the projection of any shape on any type of surface, delivering uncompromising image quality, brilliant video and professional-grade reliability. In addition, the Moverio BT-300 Smart Glasses have the potential to transform museum experiences around the world by bringing augmented reality to life. Furthermore the emergence of interactive digital storytelling, combining story generation, narration and audio, augmented with digital content to ensure that storytelling is more personal and mobile than ever before. Epson’s Projection Conference & Showcase is supported through the valued collaboration of Epson’s supporting partners including Extron Electronics Asia Pte Ltd, SOTI Inc., and Milestone AV Technologies Ltd. All three partners are integral to showcasing how integrated solutions can truly help to enhance total user experience of a projection. As the number one projector brand in the world for 16 consecutive years, this projection conference and showcase is an important milestone for Epson and is a reflection of the company’s continued market leadership and success in the visual imaging industry.